a book chick: "MWF Seeks BFF"
my take: One of my life skills classes is about friendship - which is a more universal relationship talk for the ladies than, say, male/female romances or parenting. This book will be a great resource for enhancing that talk ... categories, ways of meeting people, evaluating one's own role in current friendships... I underlined a lot. 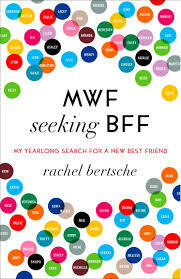 Author Rachel seemed a little obsessed with friendship - and she kind of needed to be in order to do 52 friend dates in a year. Sometimes it seemed exhausting just reading it - I'm mostly an extrovert - but, wow, that was a lot of being with people. Rachel not only enlarged her circle of friends in a new city, but became more adventurous and more confident as a result. There are a few times in one's life when one needs new friends - this informative and fun read is a great resource and inspiration for planting and growing new relationships. Inspired by your purchase/reading, I already bought my own used copy to do a re-read - thought this was one I should have a copy of on my own shelf, it's so good for friendship lessons.